Wilma Jean Brooklyn - FRIED CHICKEN SAMMY 'n' BURGER! 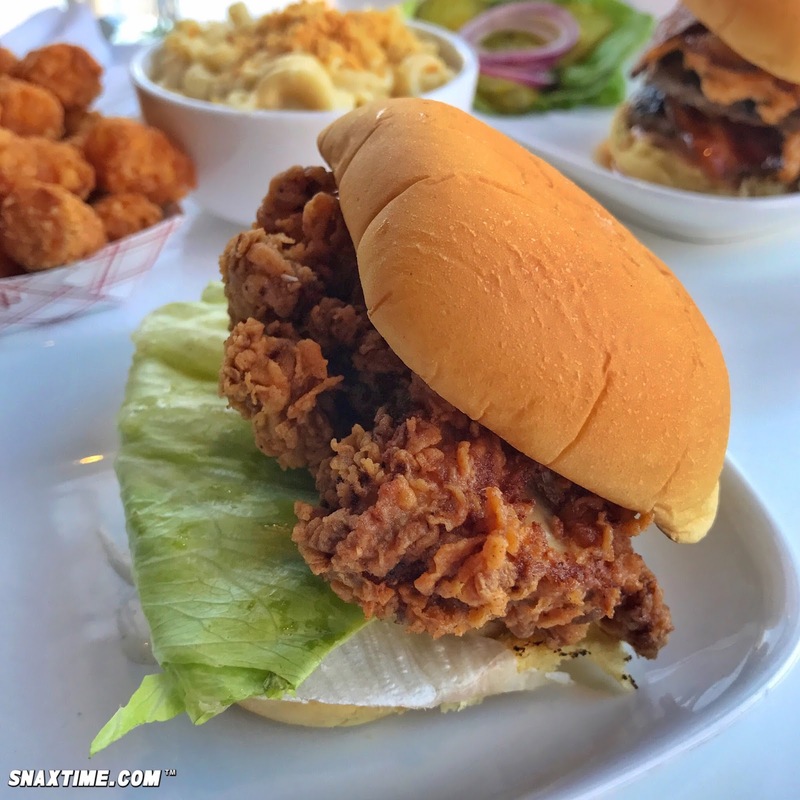 Our search for the city's best fried chicken sandwich led us recently to Wilma Jean in Brooklyn. This comfort food joint is known for their chicken and burgers so we ordered their Fried Chicken Sandwich and a Double Burger with an order of Tater Tots and Mac n Cheese for good measure. The sandwich was served on a potato roll with crisp lettuce and homemade buttermilk dressing. The chicken itself was piping hot and moist (dark meat -- our favorite) and the coating was extra crunchy with loads of flavor. The simplicity of the sammy was key with the cool buttermilk, fresh lettuce and soft potato roll all perfectly balancing the generous hunk of fried chicken. This is certainly one of the most scrumptious chicken sandwiches we've had the pleasure of meeting. We ordered the double burger with bacon and pimento cheese and boy-oh-boy were we glad we did! The burger came swimming in a pool of cheese grease with optional lettuce, onion and pickles on the side. There was also some kind of special sauce under the heavenly mounds of beef. The meat was flawlessly cooked and the sumptuous pimento cheese was tangy with a peppery bite. The bacon was thick and smoky and the entire burger kind of just melted all together. We enjoyed this burger even more than the chicken! The tater tots were good, if not a little overcooked. The mac n cheese was OK. It was borderline soupy and needed more of a gooey texture. We didn't regret ordering them, though, and finished 'em off down to the last noodle. Wilma Jean knows what she's doing and we can't wait to return and sample her Fried Chicken Dinner, Fried Bologna Sandwich and Banana Pudding. But be forewarned, eating here will leave you smelling like The Colonel's secret recipe (there is apparently no kitchen ventilation?). When we got on the subway afterwards, an old dog launched a sniff attack because we smelled so dang tasty!